April 7, 2017 11:46 am. The Group 1 Queen Of The Turf Stakes, also known as The Coolmore Legacy Stakes, is a weight-for-age for fillies and mares held at Randwick Racecourse. Prior to becoming part of The Championships in 2014 the race was held at Rosehill, over 1500m, before being switched to a mile at Randwick. The other big change in the race’s recent history was in 2005 when the race conditions were switched from handicap to weight-for-age. Some of the more well-known victors in the Queen Of The Turn Stakes are More Joyous (2011 & 2012), Typhoon Tracy (2010), Forensics (2008) and Divine Madonna (2007). 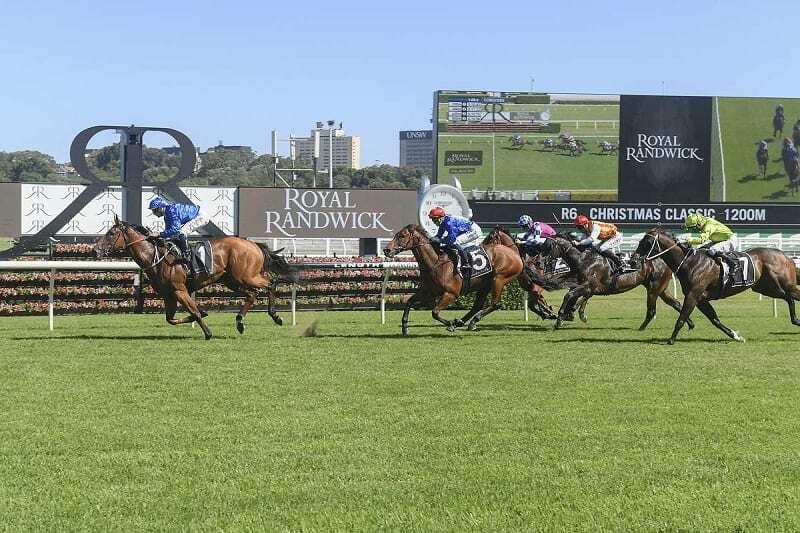 Alizee wins the Christmas Stakes at Randwick on December 29, 2018. Source: Bradley Photos. The market is having a hard time finding an outright favourite for the 2019 Queen Of The Turf Stakes. Goldophin star Alizee ($5) is at the head of affairs at the online bookmaker BetEasy with Nakeeta Jane ($7) and Amphitrite ($8) sitting on the second and third line of betting. Dixie Blossoms is at $9.50 and is the only other runner in single figures. All bookies boasting horse racing will have betting on The Championships, and with the Queen Of The Turf Stakes one of the bigger races over the two day carnival, it is a given that you will find extensive markets on this race. Click on any of the banners below to read our comprehensive bookmaker reviews. In a wide-open Queen Of The Turf Stakes it was the Mahar and Eustace Kenedna that delivered in the final Group 1 of The Championships. As the race entered the final stages there were up to 10 winning chances but it was one of the outsiders that produced a withering burst to defeat the sentimental favourite Dixie Blossoms. She wasn’t heavily favoured in the market but astute judges believed the filly could make an impact in the race. After getting well back on the turn the star came to the outside and quickly put the field to the sword to record a powerful win. Foxplay was given the title of Queen of the Turf after winning the newly-named Coolmore Legacy in 2017. The Chris Waller-trained filly sustained a long sprint down the outside of runners to overhaul the early leaders Silent Sedition and First Seal which went out too hard in front. The filly was well-backed throughout the week, but was drifting late. Read the full report. Damien Oliver had not enjoyed the best run of form during the Sydney Autumn, but that all changed with Azkadellia, who got a dream run down the rail. The $1.75 chance beat home Heavens Above by two lengths, with Noble Protector further back in third position. Amanpour, trained by Gai Waterhouse and ridden by Kerrin McEvoy, produced a brilliant exhibition to salute by almost two lengths from Catkins, with Noble Protector, who would also finish third the following year, rounding out the minor placings. Amanpour had trouble when being loaded into the barriers and had to be backed out and vetted, but once the gates opened, she made the running and never looked back. It was another near miss for Catkins in a group 1 race. Diamond Drille ($41) did it for an emotional Tommy Berry, who was still mourning the passing of his brother Nathan in a fall. Trained by Gai Waterhoue, Diamond Drille held off the John O’Shea-trained Gypsy Diamond by a short neck. Red Tracer, who produce a stunning run, failed to stay the 2000m and faded for third position. Favourite Catkins finished a disappointing sixth. Appearance ($9) was too good for Red Tracer, who would go on to finish third the following year in the same race, while Streama was further back in third. Kerrin McEvoy pulled Appearance wide as they rounded the bend, before producing a strong finish to hit the lead and hold off Red Tracer who finished full of running. Appearance was trained by the late Guy Walter. More Joyous did it again, after also winning the 2011 running of the race. Nash Rawiller pushed More Joyous forward from a wide draw, to sit outside the leader Red Tracer, before getting a nice run behind King’s Rose in the middle parts of the race. More Joyous then went three wide at the top of the straight. It hit the front at the 200m mark before charging away for an easy victory. Miss Keepsafe run on well to finish second, while King’s Rose finished third.